Setup for insects in flight. This setup take pictures of insects inflight. 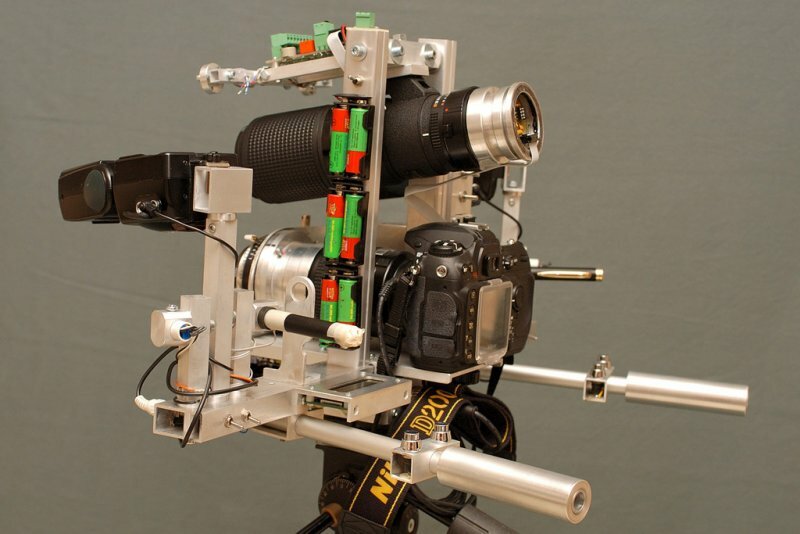 An optical extra lens system is added to look for insects in focus. Only 40 usec are needed to check if there are objects in focus. This unit works on reflected laserlight. No more leaserbeams are needed, no more long arms to put the receivers on the top of the system. The full distance is now free between camera and insects. The unit works in full dark or even in full bright sun. Sensivity can by adjusted by mean of a simple potmeter. To work in full dark 2 to 4 extra high power leds are added. 2 of this high power leds are UV leds at 405nm. This UV light attrack some insects inflight. Today the first real live tests are done. This works realy nice. At this time no insects are available considering the winter periode here. Focus distance can by adjusted to every value. The focus range of the detector is very narrow. 1 to 2 mm at a distance of 700 mm form the camera. Objects of 2 mm diameter can by easily detected. Detector works also on full black insects. 4 lasers are used, 2 IR 5 mw lasers at 850 nm and 2 x 10 mw green lasers. The green lasers are only for visual position to the insects. All electronics are mounted into the frame. One CPLD board is used and 2 boards with an AVR controller. The information from the optical system are fast transmitted from the AVR controller to the CPLD board. An 2x16 character LCD display give the status from the system. value of the batterys, value of the high voltage for the electro magnet at 150V, sensivity of the focus detector, width of the digital filter used, value of the environment light, value of the laser return light and expired time between start camera and moment of the picture.